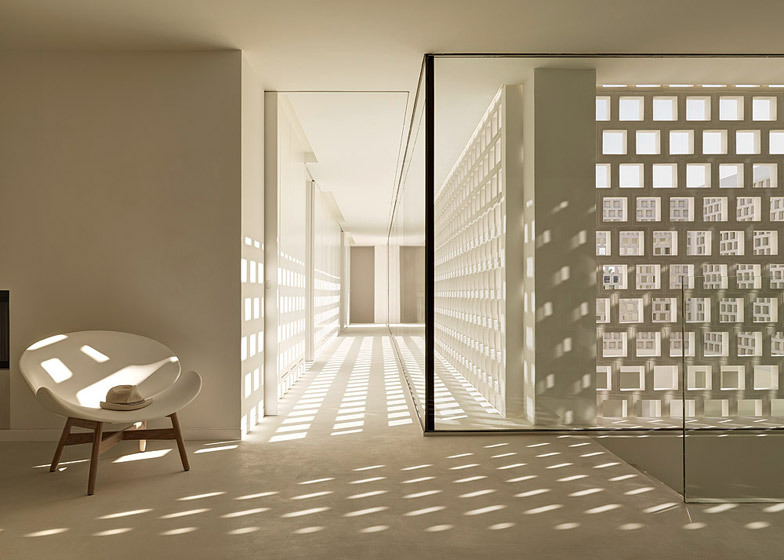 This house in Spain by Swiss architect Gus Wüstemann features a largely windowless exterior, but an internal courtyard surrounded by perforated walls ensures that light permeates the building all year round (+ slideshow). 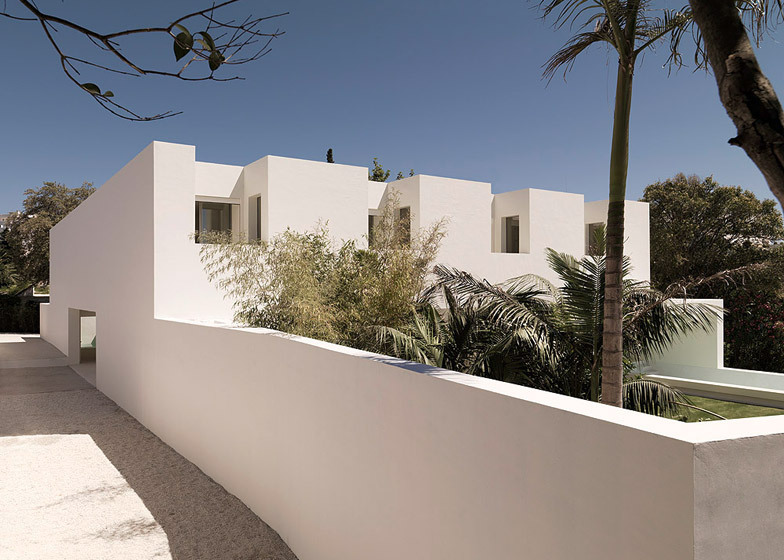 Named Los Limoneros, the house in located in Marbella. 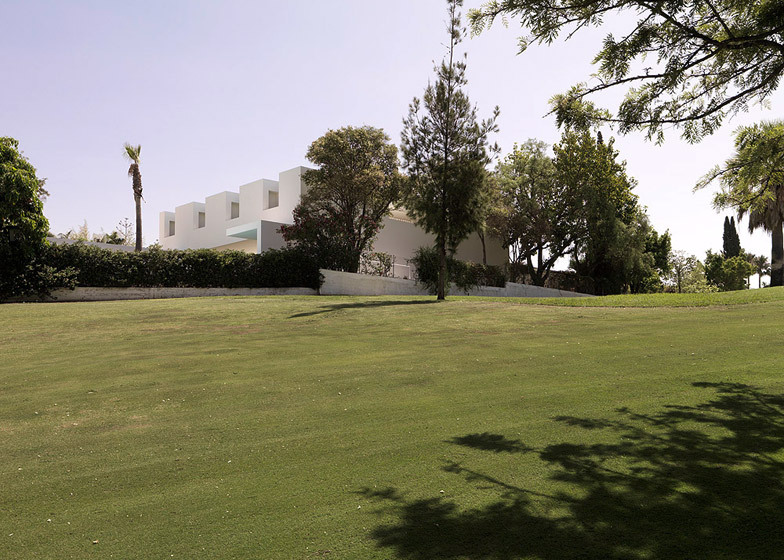 It is surrounded by private villas and bordered by a golf course, so Gus Wüstemann decided to enclose it behind austere three-metre-high walls, but also allow rooms to open out to the garden and pool. 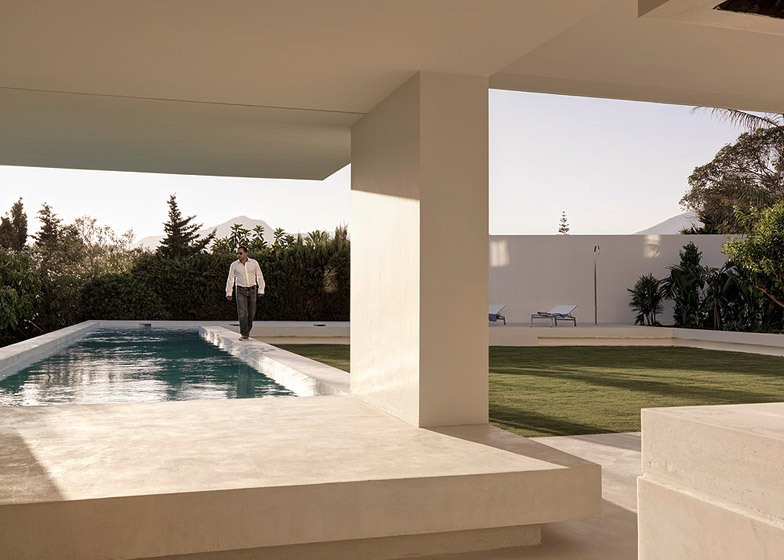 "Being in Andalucia in the south of Spain, the idea was to create a huge garden with big covered outside spaces, giving some shade when needed, where you could live outside day and night, all year long," said Wüstemann. 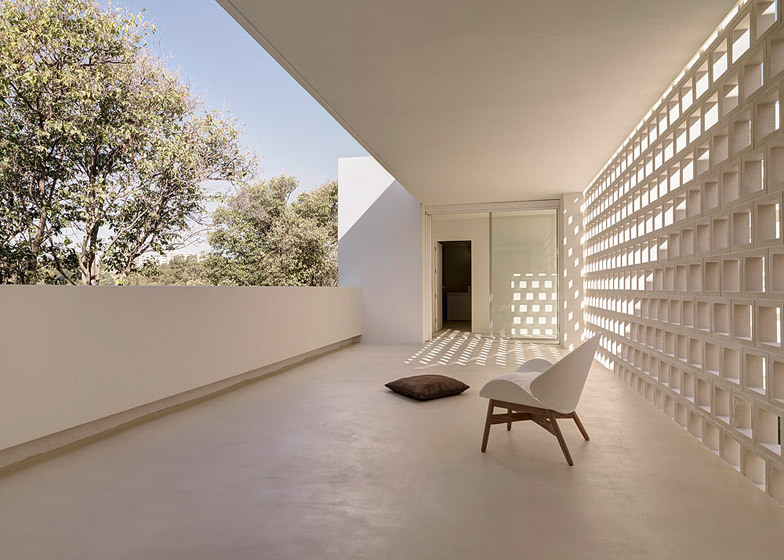 The two-storey house was designed as a second home for a family, who asked for a property where they could enjoy southern Spain's warm climate in privacy. It replaces a non-descript house that previously sat on the site. 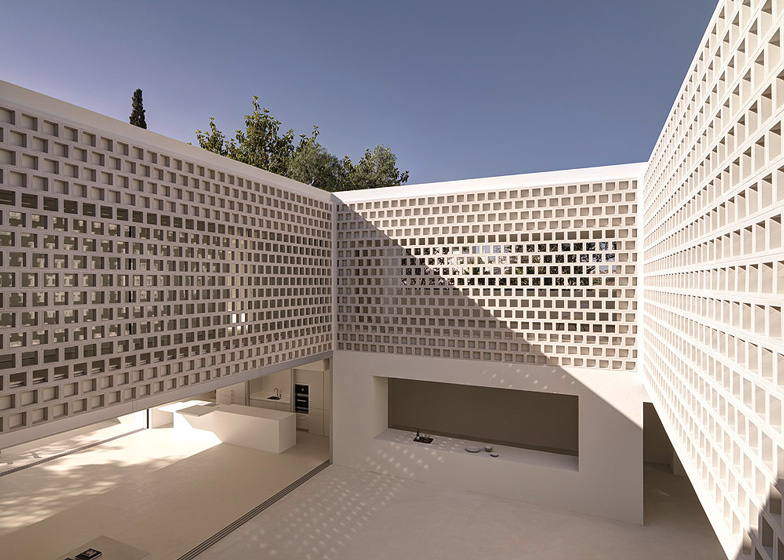 "The house appears as a white and cubic sculpture, similar to the Moorish patio houses in Andalucia. Only the plants give a sign of the interior life," said Wüstemann. The building was constructed with a strict 12-month schedule. 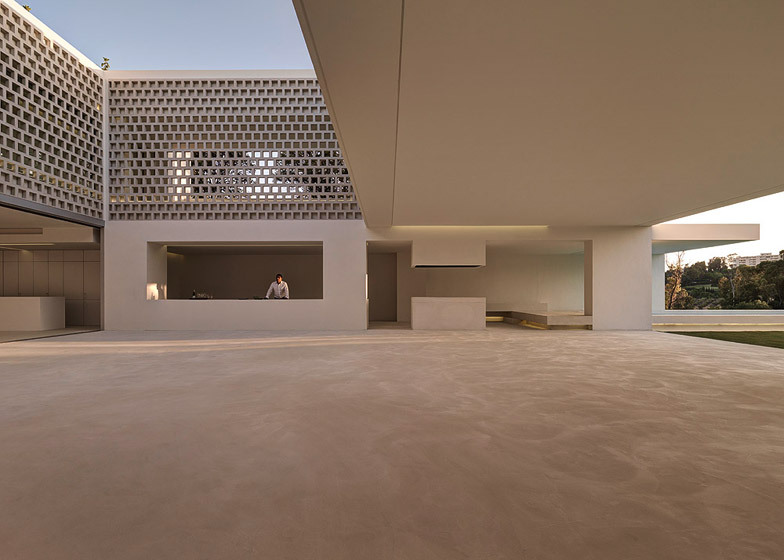 "From the beginning, the moving in date was set," Wüstemann told Dezeen. "After the first brainstorm, we developed the house and it still looks like how it was presented the first time, which is amazing. 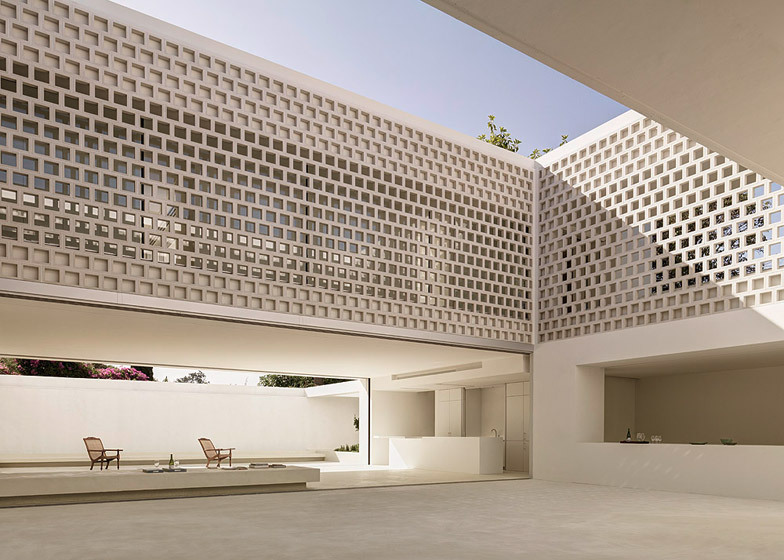 The client trusted the architect." 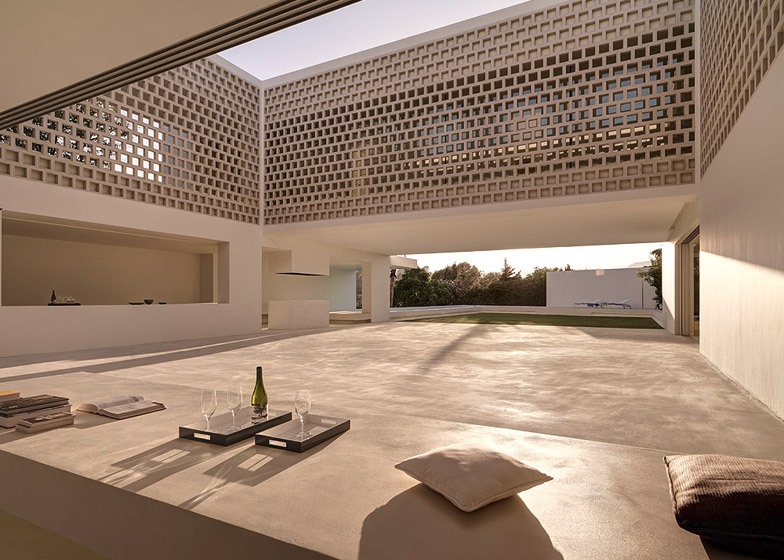 The ground floor is conceived as a garden with living spaces arranged around the periphery. 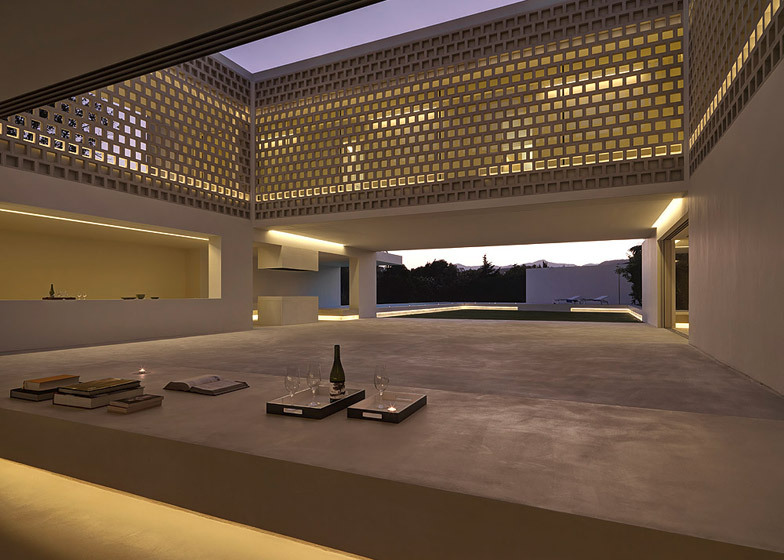 An open-plan living room, dining area and kitchen is at one end, and a pool and lawn are at the other end. A covered bar, lounge and patio are at the side, and an open-air courtyard is in the middle. 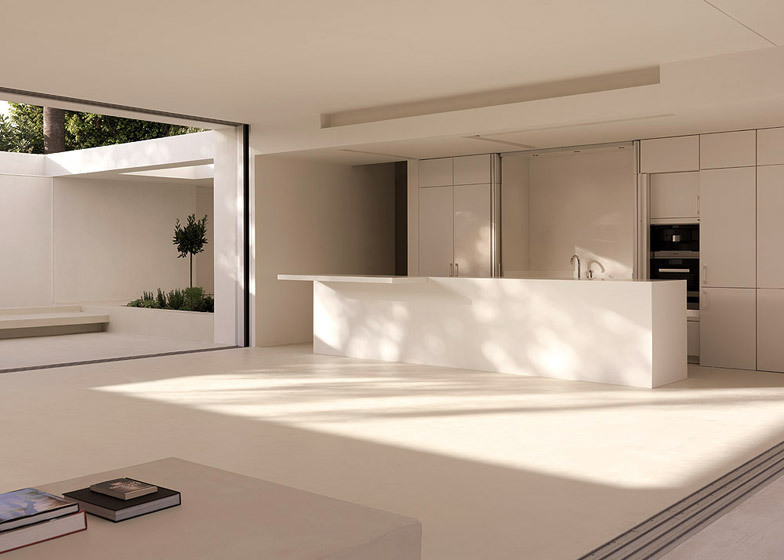 The combined kitchen, dining and living area features 14-metre-wide openings on both sides with glass sliding doors, so the space can be closed off when necessary. The rest of the ground floor remains open all year round. 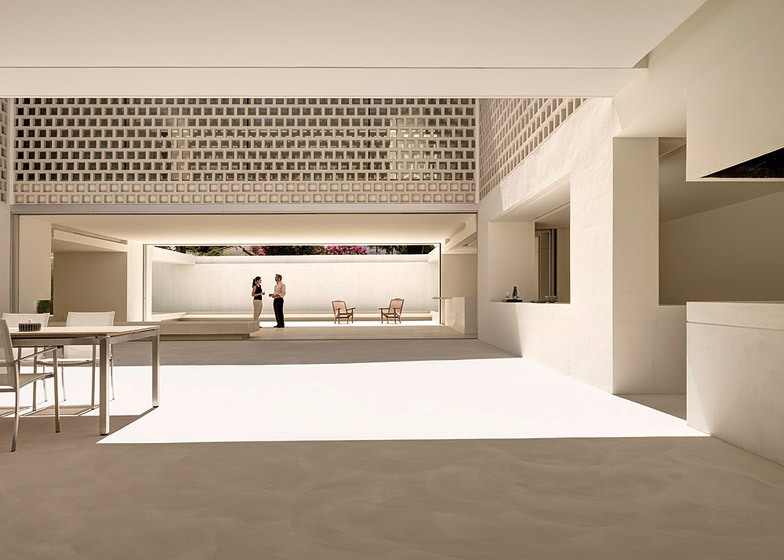 "The occupants can choose to interact with the peripheral areas, from leisure and sport to reading and cooking, depending on the time of day, their mood, and how many people are in the house," said Wüstemann. 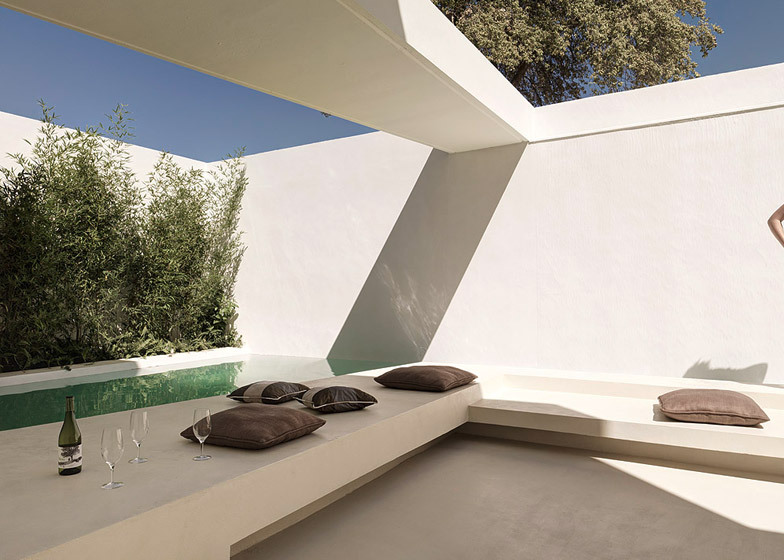 Water forms an integral part of the design. A pool folds around a corner of the lawn, while a pond wraps around a patio at the opposite corner, behind the main living space. "We used water as a meditative element with the quiet patio pond, where the owners can enjoy morning sun, and as an active, sporty element with the pool. 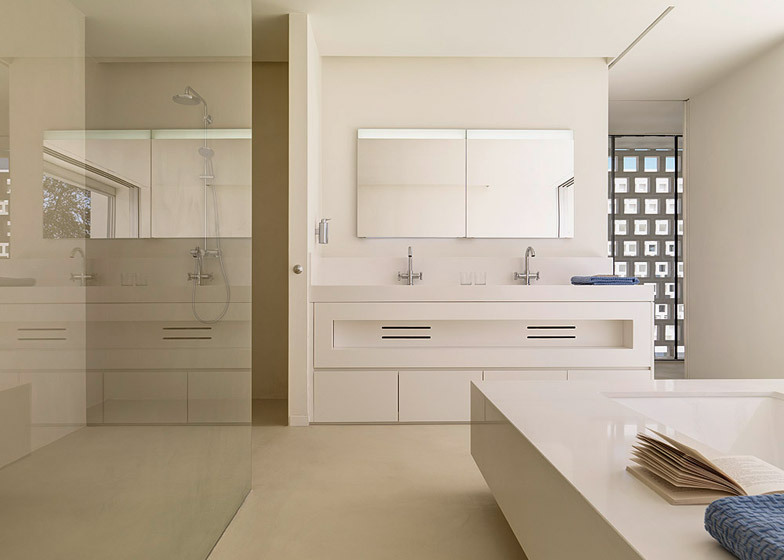 Both elements are at the corners, and add a freshness to the home's microclimate," said Wüstemann. The upper level features more private spaces, with bedrooms and bathrooms around the periphery, and a circulation route around the centre, overlooking the courtyard below. 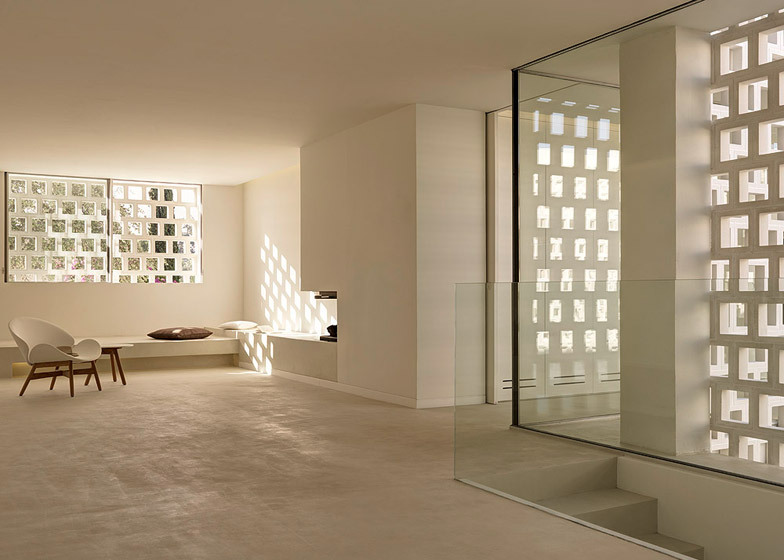 A perforated wall brings light into the circulation areas, while maintaining a degree of privacy for the upper level. One end of the upper floor has a master suite, with a bedroom on one side, a bathroom on the other side, and a terrace in between. 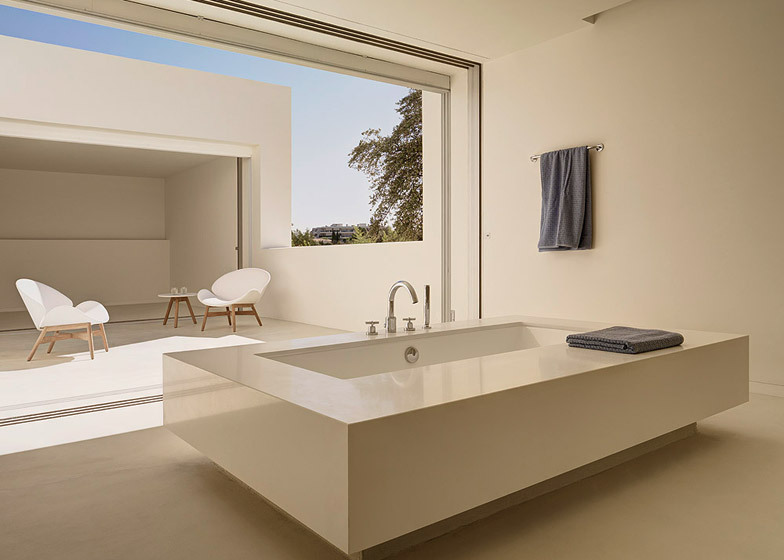 "The master bedroom, bathroom and patio can become one open space, so the owners can enjoy sleeping and bathing outside, without being seen," said Wüstemann. 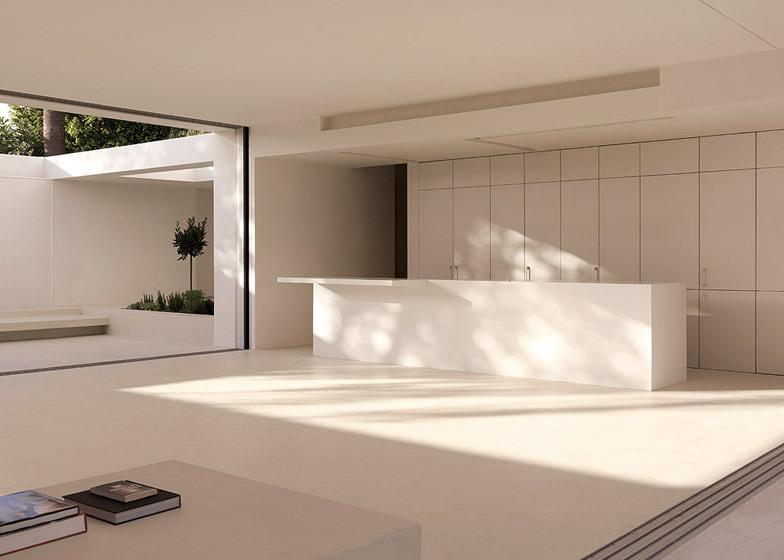 The other end of the house features four bedrooms, each with its own bathroom and terrace, which are separated by sliding doors. 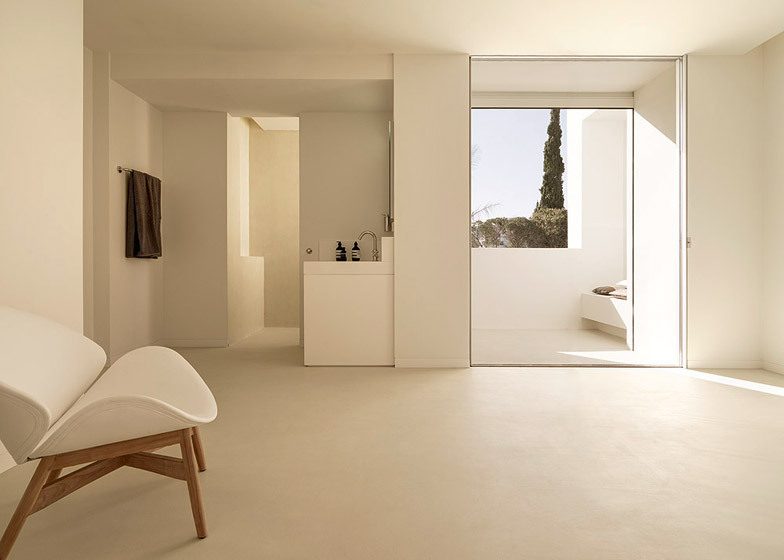 "The four bedrooms can be separated into single rooms with the sliding doors, or opened up and used as a loft space," said Wüstemann. 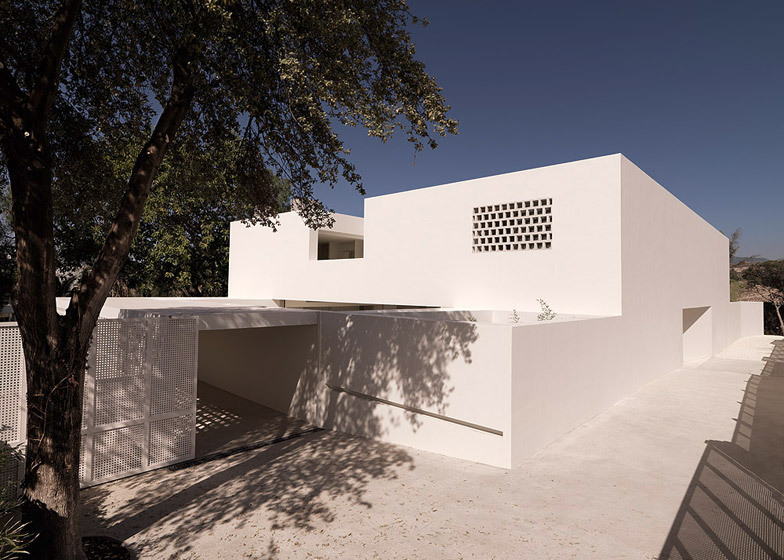 The home's exterior is covered in white plaster to reflect the sun, and a white mineral-based concrete coating has been used for the flooring inside.